Vice President Mike Pence will sweep into competitive districts to help stump. With a freewheeling address to the party faithful at Conservative Political Action Conference last month, President Donald Trump kicked off his involvement in the 2018 campaign season as if 2016 had never ended. “You don't mind if I go off script a little bit because, you know, it's sort of boring,” Trump said, veering off his teleprompter and whipping up the crowd. Chants of “lock her up!” quickly ensued. But as Trump heaves political red meat to rally his base for the midterms, he’s leaning on Vice President Mike Pence to sweep into competitive districts to make the sell – and raise some serious cash. (Michael Brochstein/Getty Images) Vice President Mike Pence at the Conservative Political Action Conference (CPAC) sponsored by the American Conservative Union held at the Gaylord National Resort & Convention Center in National Harbor, Md. When Pence spoke from the same podium at CPAC, his measured and dogmatic address on the administration’s policies was a study in contrasts with his boss, even as it stirred the crowd in a different way. Multiple people close to the Trump political operation have described Pence as at the heart of its formula for 2018 voter engagement. While President Trump plays the starring role as a one-man-band style closer, the vice president is being utilized as the “tip of the spear,” says Pence’s outside political adviser Marty Obst. The vice president has set an aggressive campaigning calendar that has him on pace to participate in nearly 40 campaign events before the end of April to promote Republican candidates in House, Senate, and governor’s races, according to a Pence aide familiar with the plans. Aggressive deployment of the vice president on the campaign trail this spring and summer is in part a nod to the uphill battle Republicans face in holding the House and Senate in November, several Pence advisers told ABC News. The party in the White House has historically lost seats in the midterm elections, and in the most recent ABC/Washington Post poll, Democrats held a 12-point lead on Republicans in a generic ballot among registered voters. Trump, his political team and Republican Party leaders decided during a Camp David retreat early this year to green-light Pence as their top surrogate, sources familiar with the meeting said. The vice president plans to target his early campaign activity in reliably GOP districts but where the party isn’t being overly confident, according to a political adviser to the vice president. After Labor Day, the expectation is that Pence will be a rapid response surrogate to help shore up support in tight races. As the GOP tax cuts take hold – and millions of American workers potentially start to see larger paychecks – Pence’s top priority is to create a direct line to the president and Republican lawmakers, Pence communications director Jarrod Agen told ABC News. “The president's tax cuts are benefiting American workers across the nation and it was only achieved thanks to this Administration and Republican leadership in the House and Senate,” Agen said. 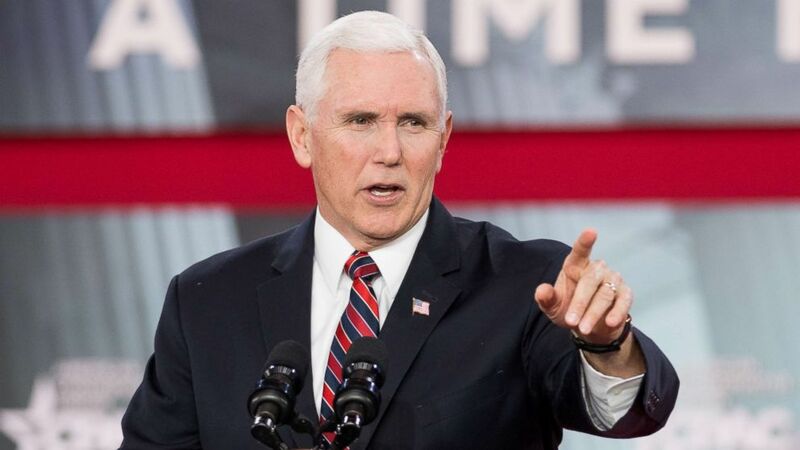 Obst, Pence’s outside political adviser, said Pence is seen by the president’s political team as particularly well-suited to make the case because of his message discipline. 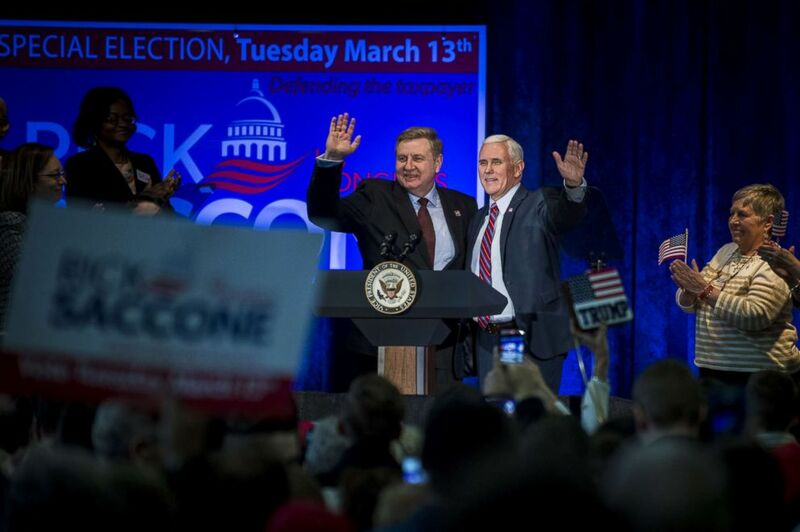 (Pete Marovich/Getty Images) Republican Pennsylvania congressional candidate Rick Saccone and Vice President Mike Pence acknowledge the audience during a campaign event at the Bethel Park Community Center on Feb. 2, 2018 in Bethel Park, Penn. Even as Pence serves as one of President Trump’s most loyal and ardent defenders, Obst says the vice president counsels candidates to stick to the tax reform-focused message and aggressively sidestep distractions and dramas coming from the West Wing on any given day. The administration’s strategy is getting support from the Trump-allied advocacy group America First Policies, run by several of the president’s former advisers. The group has organized a “Tax Cuts to Put America First" tour across the country in tandem with the vice president’s campaign schedule. The group has already hosted four events in the tour — first in Pennsylvania, then Texas, Michigan, and Iowa — and the vice president has made appearances at each event, with more to come. "We've extended an invitation to the Vice President to be our special guest at all events, and we are grateful he's been able to join us," says the group's communications director Erin Montgomery. Democrats are preparing to counter Pence, arguing the realities of the economy for the middle class sharply contrast with the GOP messaging on tax cuts. They also don’t appear intimidated by Pence’s involvement in key races. “It doesn’t matter who the messenger is, it’s the GOP’s agenda – more expensive health care costs while corporate executives and big industries like pharmaceutical companies get a tax handout – that is repulsive to voters across the country,” said David Bergstein, Democratic Senatorial Campaign Committee spokesman. Tyler Law with the Democratic Congressional Campaign Committee said the special election this month in Pennsylvania’s 18th Congressional District is already highlighting flaws in the Republican pitch. Pence’s advisers say his ability to raise money from the Republican grassroots is an indication his strategic appeal in the midterms goes beyond the message. Since becoming vice president, Pence has raised nearly $20 million to benefit various campaign committees and GOP candidates, according to a political adviser to the vice president. A key vehicle of the vice president’s fundraising activities this year is a first-of-its kind leadership PAC – the Great America Committee -- registered to Pence’s name. 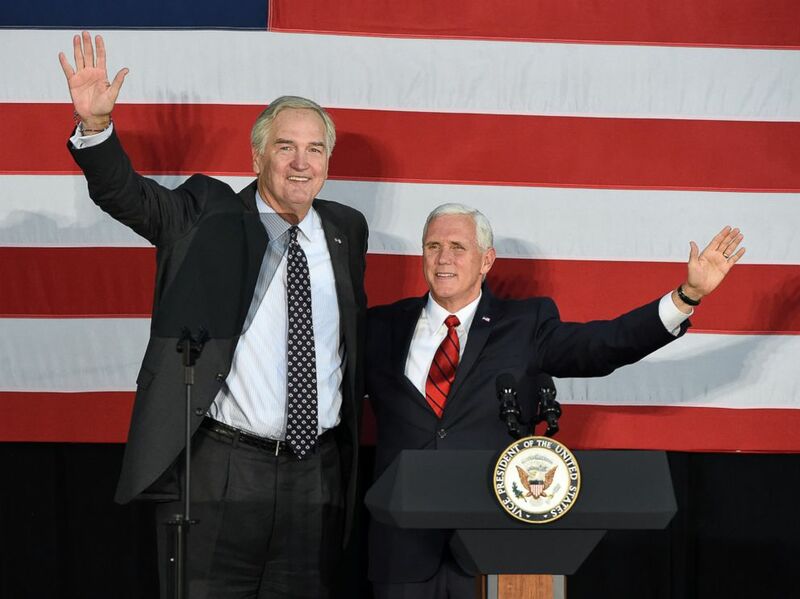 (Joe Songer/AP) Vice President Mike Pence, right, makes a campaign stop to support Sen. Luther Strange in Birmingham, Ala., Sept. 25, 2017. Since its creation last year, Pence’s leadership PAC has cut two rounds of checks: the first round went to max-out donations to President Trump’s 2020 reelection campaign and the second round of checks to support 40 priority House and governor’s races across the country, each getting a $5,000 cash infusion. In the long run, the PAC also offers Pence the opportunity to maintain relationships with donors that the administration will again want to call on again during the president’s 2020 reelection bid. The vice president’s fundraising activity has spurred speculation about his own future political ambitions. But people close to the vice president dismiss suggestion he will seek the presidency in 2020, pointing to Pence’s deep loyalty to the president and the reality that the leadership PAC’s funds can only be applied to the campaigns of other candidates. “The bigger question I ask people when they ask why the leadership PAC was formed is, why hasn't anyone else [done one]? It's another tool in the tool kit to help candidates,” Obst said. The PAC also has the blessing of the Trump family, sources say. When the PAC held a summit at the Trump International Hotel in Washington DC earlier this year – raising half a million dollars over two days — the president’s eldest son Don Trump Jr. even introduced Pence for his keynote speech, according to people close to the vice president. Pence’s 2018 fundraising blitz also aims to maximize donations across all of the party’s committees, including the RNC, NRCC and the NRSC, and individual candidates, his aides say. In the case of the RNC, an official said Pence has worked hand in hand with the committee to raise $4.5 million since last summer and is expected to bring in another $2 million through upcoming events. When Pence was last in Pennsylvania to support Republican Rick Saccone ahead of the upcoming special election for an open US House seat, Pence hauled in a quarter of a million dollars for Saccone. Republicans have had mixed results in off-year elections since Trump took power. In Alabama, Democrat Doug Jones pulled out a victory in the deeply red state against Republican Roy Moore, who had the backing of the White House, in the special election for Jeff Sessions’ US Senate seat. Pence went all in to help elect Republican candidate Ed Gillsepie in Virginia governor’s race late last year, but Democrat Ralph Northam prevailed. While some pundits have ominously forecast a coming Democratic wave, the vice president and his team shrug it all off.